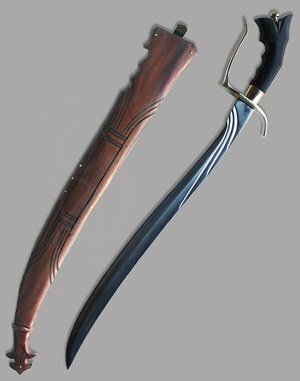 The Aethernis is a high-carbon, fully-tempered, sharpened, and battle-ready reproduction of Filipino style, pre-conquest swords. 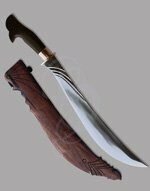 But I always think of fantasy blades when I look at this one. Each of these swords is hand-forged by Filipino master smiths. How masterful are these masters? 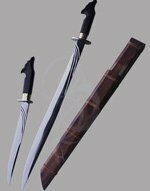 Well, they have been hand-forging battle-ready swords for a handful of generations, and some of the top martial artists in the East own weapons from this line. 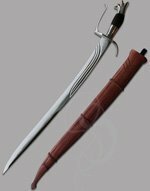 The Aethernis belongs to one of the most exquisite lines of swords that we sell, used by master martial artists and blade enthusiasts alike to practice swordsmanship and cutting techniques. But, as I mentioned earlier, the look of these weapons is all fantasy. 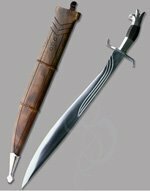 The curves of the blade scream of elvish grace, with sweeping flourishes arching along the forte of the blade. And that hilt... Ah, yes, the hilt. It roars with the authority of command. The polished-hardwood grip curls back to provide a comfortable and secure hold. A long brass knucklebow extends the length of the hilt, and a smaller forward-guard on the opposite side is a perfect notch in which to trap an opponent’s blade. If this sword could speak, it would probably say something like, “For the love of all that is holy, tell that bearded guy to stop hitting me with a hammer and sticking me into a forge!” Once it calmed down, it might add, “I am elegance and death. Do you think you have the strength to wield me?” A blade of this caliber can’t just be stuffed into a plain, sheath. No. Blades like this must be lovingly caressed in a custom carved wooden sculpture. Aethernis has a beautifully ornamented soft-wood scabbard with an ingenious, integrated metal clip that grips the hilt firmly and makes sword-frogs a thing of the past. What will those Everlords think of next? If you’re looking for a masterwork saber that is both beautiful and functional, then look no further. If you seek a fantasy sword that goes well with your cosplay garb, but can still cut through a bamboo roll with ease, then your quest has ended. If you’ve been searching for a martial-art weapon based on Filipino designs and forged by master smiths, we have your sword. And if you’re looking for a nice pink tube-top with lace trim, stop looking for that and buy this beautiful sword.